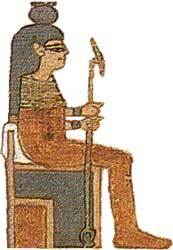 The goddess Nut was the daughter of Shu and Tefnut and the wife of Geb, the earth god. She was the goddess of the daytime sky and the place where clouds formed. In later periods, she was no longer the goddess of the daytime sky, but of the sky in general. The goddess was typically portrayed as a woman who wears on her head a vase of water . Many times she is shown as a woman whose hands and feet touch the ground so that her body forms a semi-circle. As such she represents the heavens. Her arms and legs represent the four pillars on which the sky rests. She is held up by her father Shu (the god of the air). 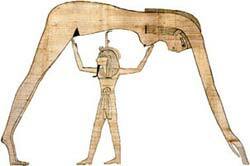 Her husband Geb lies on the ground reclining on one elbow and his knees in the air. In this position he depicts the hills and valleys of the land. It was said that when Shu raised Nut (the sky) above Geb (the earth) he brought an end to chaos and if he ever left this position, chaos would return. In one myth Nut gives birth to the Sun-god daily and he passes over her body until he reaches her mouth at sunset. He then passed into her mouth and through her body and is reborn the next morning. Another myth described the sun as sailing up her legs and back in the Atet (Matet) boat until noon, when he entered the Sektet boat and continued his travels until sunset. Nut had four children with Geb. Osiris and his wife Isis, along with Seth and his wife Nephthys. The circumstances of their births is described in the The Story of Re . They were born on the five epagomenal days of the year (in Egyptian, "the five days over the year"). Every year these days were celebrated throughout Egypt. Isis, lucky day, called "a beautiful festival of heaven and earth."